If you are looking for the most comfortable dress look no further! 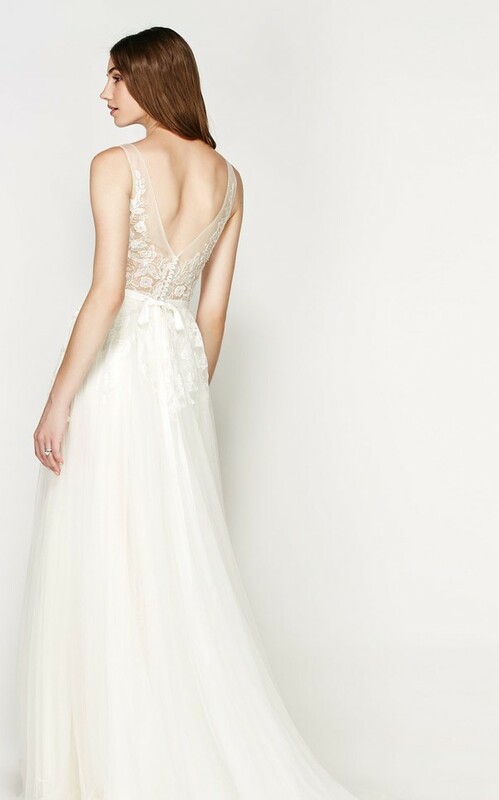 This beaut is not only the prettiest dress I've ever seen, but also extremely light and easy to wear. The base layer is almond colour, the lace and tulle (3 layers) are ivory. The tulle is super soft, hence it has a floaty look (amazing on pictures) and great feel. If you get half as many compliments in it as I did, you'll be the happiest! The pictures won't do justice, it looks 100 times better in real life. It has a soft V-neckline and a natural waistline that will flatter all brides by highlighting the waist at its slimmest point. The pearl buttons and ivory Grosgrain Ribbon are the perfect finishing touches. I wore it with a tulle sash, which made it look even more romantic (I will include both ribbons). Although it's used, it's in great condition, no rips or tears. You're welcome to pop in to try it, or have a look if needed. I'll include both ribbons and the garment bag too. I got the train removed and the length adjusted (I'm 5' 6"/ 167cm) and the dress was taken in around the waist a bit. The dress has C/D cups sewn in, but these can easily be removed. The pearl buttons at the back weren't sawn on securely enough originally, so this had also been resolved (although this doesn't change the look/size, just good to know). Once you send a message, Viki can invite you to purchase the dress.